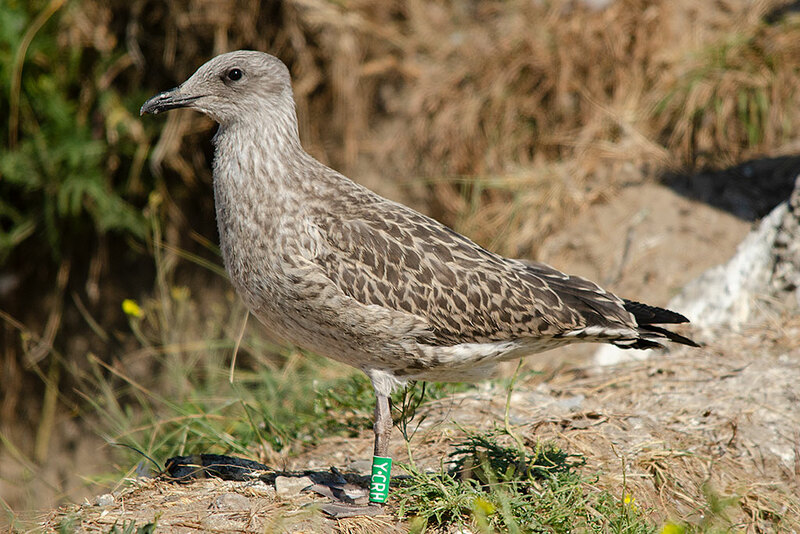 With the breeding season coming to an end soon, we would like to inform you that some of the Herring Gulls and Lesser Blacked-backed Gulls of the IJmuiden Forteiland gull colony in the Netherlands have again been ringed this year. About 100 gulls were fitted with a colour ring; a mix of adult and juvenile Herring Gulls and Lesser Black-backed Gulls. The rings are fitted on the left tarsus and are dark green with a white code starting with ‘Y.’ followed by 3 letters. For the adults, the codes range from Y.CHL to Y.CPZ. For the juvenile birds, the codes range from Y.CRA to Y.CTS. 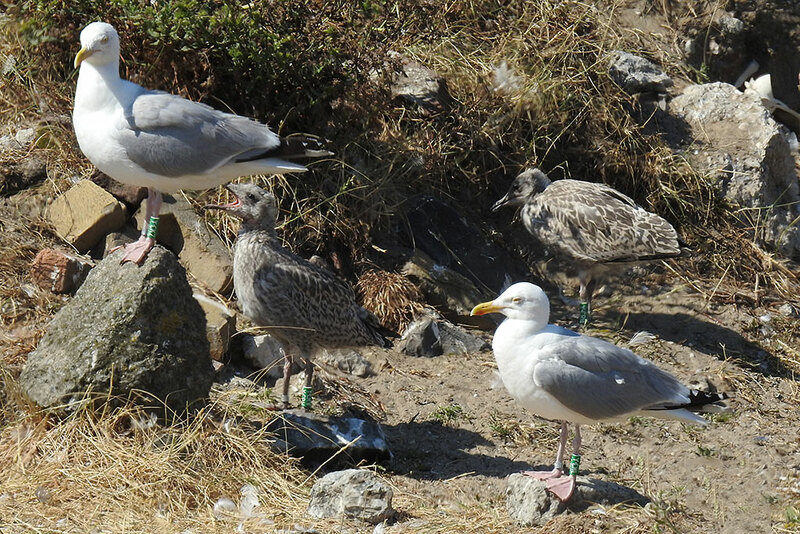 Above: A Herring Gull family in which the father, mother and both their young have all been ringed this year. This allows us to follow partner fidelity, differences in dispersion, diet and fouraging locations, plumage development, moult strategies, annual survival, and much more. IJmuiden, July 2018. Above: Juvenile Lesser Black-backed Gull Green Y.CRH. IJmuiden, July 2018. Above: The gull colony on IJmuiden Forteiland, the Netherlands. The gulls will soon leave the colony for the nearby beaches and towns and later to the wintering grounds in the Netherlands, Belgium, UK, Northern France, Spain, Portugal, and some of them even to Morocco and further south. Should you come across any of our gulls, we would be very interested to hear from you! We are also very interested in the plumage development of our birds (of all ages) so if you have any photos then please send those too. Contact details can be found on cr-birding.org. We especially like to bring to your attention juvenile Green YCRK. 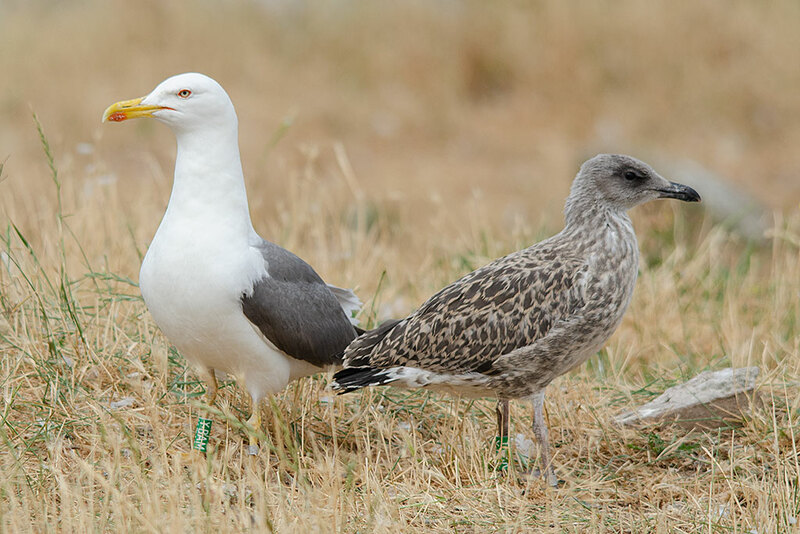 Its father is a (presumed) hybrid Yellow-legged Gull x Lesser Black-backed Gull (see image above), and its mother is a Lesser Black-backed Gull. Both are also colour ringed. We are very interested to know where this young gull will spend the next few years and how its plumage will develop. As a juvenile it very much looks like a Lesser Black-backed Gull, but we assume that its adult plumage will be a lighter grey than our standard adult Lesser Black-backed Gulls (which are Larus fuscus graellsii – Dutch intergrades). Its plumage development could be very similar to that of a similar gull with hybrid parents, namely Green YBWP. We would very much like to receive images of this gull over the coming years.